Finally, it was time to put the new roofing material on. This is similar to painting a locomotive in that there are weeks of preparation, and a much shorter time actually applying paint. One thing I want to expound on is how great the products and services of the Heely-Brown company are. I bugged these guys with questions for weeks prior to the job, and they were always helpful; and you know this wasn't a big sale. Here's a picture of their storefront, they're basically on North central street in Knoxville Tn. Heely Brown Company Knoxville Tn. In the next picture, you see the existing roof boards as I'm sanding the corners. The wood has dried over the years with a little cupping on the face of the boards; this makes the joint where two boards meet have two sharp corners. I'm using a 4.5 inch angle grinder, with sandpaper; but what really helps me have more control over the tool is that it doesn't have a plastic pad behind the red sanding disk. I just use two disks together, for added rigidity. As the top one gets dull, it becomes the bottom one, is replaced by a new one, and the previous bottom one is tossed. This was actually a fairly fast step, as the corners only needed a quick pass to knock them down. In the next picture, I've laid out a clean tarp to work on, as I roll out and cut the roof material. The shop has a lot of mechanical work done in it, and this was easier than trying to clean the floor. I carefully measured the pieces, and cut them to size. I used a square, but also measured corner to corner prior to cutting, to be sure the cuts were 90 degrees. I rolled the pieces back up, then stored them inside the caboose till it was time to adhere them. I don't have pictures of the adhering stage, because I was working with a crew supplied by the RR, and I didn't want them to wait for my picture taking. A few days before the actual event, one of the crew said that he was advised to use a kitchen rolling pin to help flatten the roof material while it was being laid onto the wet glue, when he did a similar job. The supplier of the material said to use a push broom, which I had on hand, and used along with the rolling pin. Upon thinking about it though, I would rather use the push broom only; because there were irregularities in the surface we were adhering to. As the hard rolling pin struck these bumps, it could have stretched and strained the rubber roof material. Besides, the push broom did work very well. After the roof was on, I had to apply the aluminum trim. This material is available from the supplier; it has holes about every 5.5 inches, and if I recall, comes in 10 foot long pieces. In this next picture, you see the extra length hanging off the edge, over the curved facia board where it will be fixed by the trim. Upon seeing this waviness, I was quite concerned that it wouldn't lay flat under the metal trim. I need not have been worried. I want to expound on how very nice this material is to work with. I've never used it before, but it felt as though I had been using it for years. It laid flat, even in places where other films would have had wrinkles. I do have years of experience with vinyl films for sign making; which would have presented many problems. This rubber roofing is very different, it's a dream by comparison. Not only did it lay flat where I didn't expect it to, but it conformed perfectly to carriage bolt heads None of this description is exaggerated, seldom in more than 30 years of experience have I worked with a material that handles this well. Next is a picture of how I altered the metal trim to fit the curves. I put it in a vise, and used the electric saw to cut down to the outer edge lip part. I made a piece of paper which was the length of the distance between two holes, then folded it in half, where I made a pencil mark. This paper was my quick measure for marking where to cut. The next picture shows the trim bent to the curve, and the picture after that shows how I mitered the trim at the edges. Being that the trim with all the cuts had a bit of flex to it, I couldn't just hold it in place to make a mark, then cut it on a bench. I mitered the side piece, which had no cuts in it; then with that piece in place, I installed the curved metal trim. Take note however, that the side piece must also be measured and marked carefully. The caboose is old, some of the boards aren't exactly square, plus, the rubber material had a folded over, glued down flap, which can change the cut off angle of the pieces. The 1 X 4 board insert keeps the power tool blade away from the soft roof material. 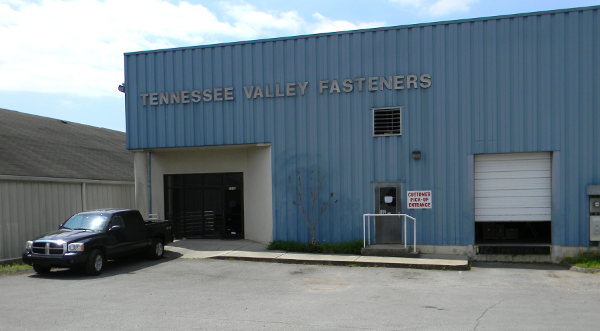 All the fasteners for this project come from Tennessee Valley Fasteners. I like dealing with this company more than other fastener companies in Knoxville.